Some people ask 'how can i use program such us Internet Download Manager (IDM) in Linux ?'. Yes !! !, to get a file or download in internet is an absolute activity now days, by download manager/accelerator having download is more easy and fast, Here the 5 Recommended Linux Download Manager/Accelerator Program widely use in linux. MultiGet is an easy-to-use GUI file downloader for Windows/Linux/BSDs/MacOs. It's programmed in C++ and has a GUI based on wxWidgets. It supports HTTP/FTP protocols which covers the requirements of most users. 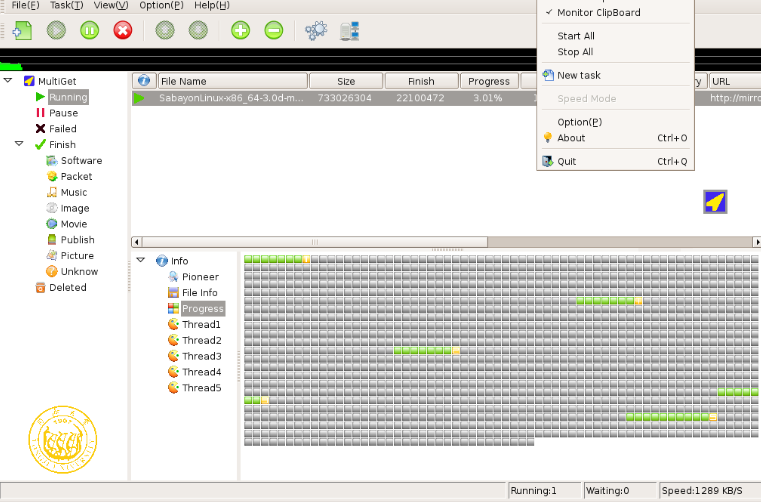 It supports multi-task with multi-thread on multi-server. It supports resuming downloads if the Web server supports it, and if you like, you can reconfig the thread number without stopping the current task. It's also support SOCKS 4,4a,5 proxy, ftp proxy, http proxy. (http://multiget.sourceforge.net/). Folow this link to download Multiget. In the previous version a axel is a command line download manager, but now having download with axel can be done under GUI, It can possible to do a multiple mirrors for a download using tihis application. Axel has no dependencies and is lightweight, so it might be useful as a wget clone on byte-critical systems. we can install axel by typing "apt-get install axel" in a terminal. Aria2 is a command line download manager. The transfer can be paused, resumed, queued and saved. It has a very user friendly GTK based GUI, and useful log consoles. Program supports CRC checking, HTTP proxy server, cut-and-paste, drag-and-drop, and can define specific file retrieving procedure for particular web servers. Aria2 can download a file from multiple sources/protocols and tries to utilize your maximum download bandwidth. It supports downloading a file from HTTP(S)/FTP and BitTorrent at the same time, while the data downloaded from HTTP(S)/FTP is uploaded to the BitTorrent swarm. Using Metalink's chunk checksums, aria2 automatically validates chunks of data while downloading a file like BitTorrent. to install aria2 you can type "apt-get install aria2" in your terminal. we can manualy download and install prozilla form www.sourceforge.org.